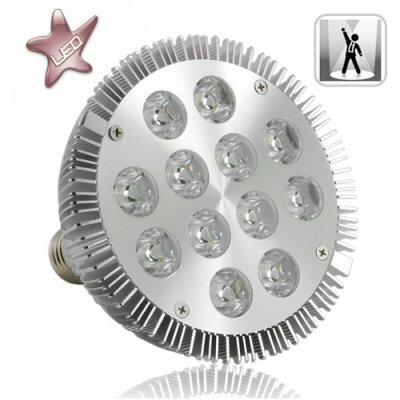 Successfully Added 12W LED Spotlight Bulb to your Shopping Cart. White LED spot light for use in standard screw base incandescent sockets. Our 12W G159 model produces a ultra-bright white color of light and emits enough light to replace incandescent and CFL's for many spot lighting and flood lighting tasks where directional lighting is needed. This professionally designed LED light bulb (often called an LED lamp in the trade) fits into a standard screw base incandescent lamp socket. This is an extra bright 12 watt version, so you can use this LED spotlight to replace the 75-100 watt bulb you have in your spotlights or floodlights, thereby saving yourself anywhere between $50-100 a year in energy costs while giving you a similar amount of illumination. Now just imagine if you replaced those six incandescent outdoor security lights you have with these LED's, that could potentially save you $500 a year! The design and manufacture of these LED lights is beyond compare - from the all metal die cast cooling fins to the IC boards that drive the diodes, every part has been manufactured to exceed world performance standards. You simply cannot find a better built 12 watt LED spot lighting lamp than the G159! Great for retrofitting into existing floodlights, track lights, downlights, or other lighting fixtures with a directional lighting distribution, these white LED light bulbs deliver smooth and uniform light. Chinavasion offers this LED light bulb with factory direct low china wholesale price and we'll even dropship it to your customer. Then you can buy in bulk to replace the inefficient incandescent lights around your business or home with these specification grade Chinavasion LED lamps. True professionally designed lamp casing (heavy gauge all metal design), not plastic like the cheap LED lights on the marketplace today. This is important - most LED's in the market today use plastic casings that will only last a few months before degrading, the G159 has an all metal design that will give you years of reliable use. One of the lights is in my kitchen. Which is fantastic. So instead of turning on the lights late at night for the "Snack"... It is already ON. Makes it super easy finding my way back to bed. No more hunting to find the light switch or remembering to turn OFF the lights. So if you buy them HERE (which you should for good Karma IMHO) or not. LED Cree is the way to go. A crazy review for a Light bulb. But I'm ordering more again. So what the hey. Mush light for little electricity and the color temperature is 5000 kelvin good for judging picture. Going to buy some more. on 2010-03-03 14:06:50 Best Light Bulb I own! As sort of a "Goof" I setup several LED light bulbs to light my garage 24/7. No matter which LED "Bulb" I tried.. they all sucked. Several so called Expensive "Bulbs" actually went DIM after the first week! This 12W Cree LED light bulb is fantastic! It has been running 24/7 for over 3 months now. Has yet to go dim. Plus I get this warm fuzzy feeling that my garage is pretty well lit for only 12 watts of energy. You really do GET WHAT you PAY FOR with this bulb. Wonderful - Powerful LED light.